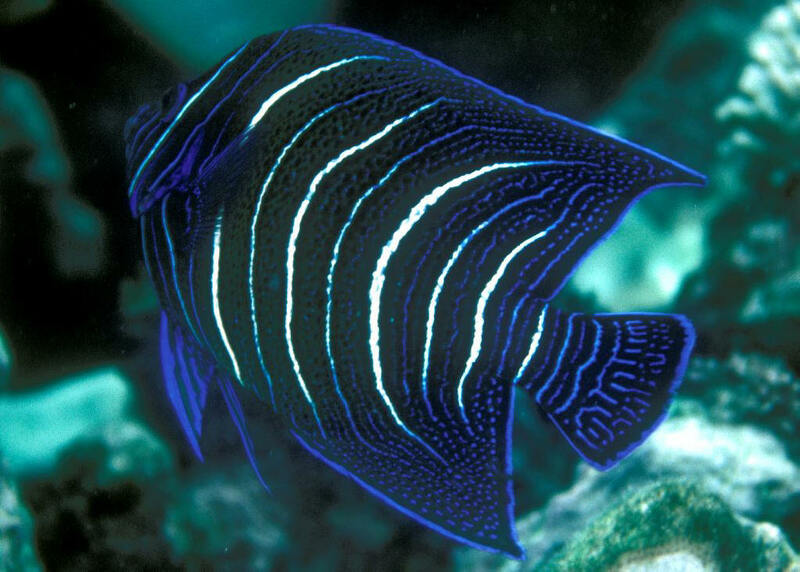 Pomacanthus semicirculatus (Cuvier 1831), the Koran or Semicircle Angelfish (1). 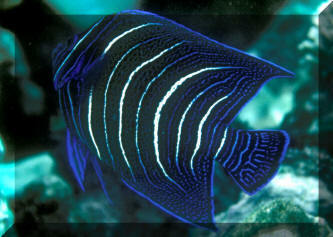 A beauty from throughout its wide range, Indo-west Pacific eastward to Africa, but not the Red Sea. To about thirteen inches in length. A late juvenile. 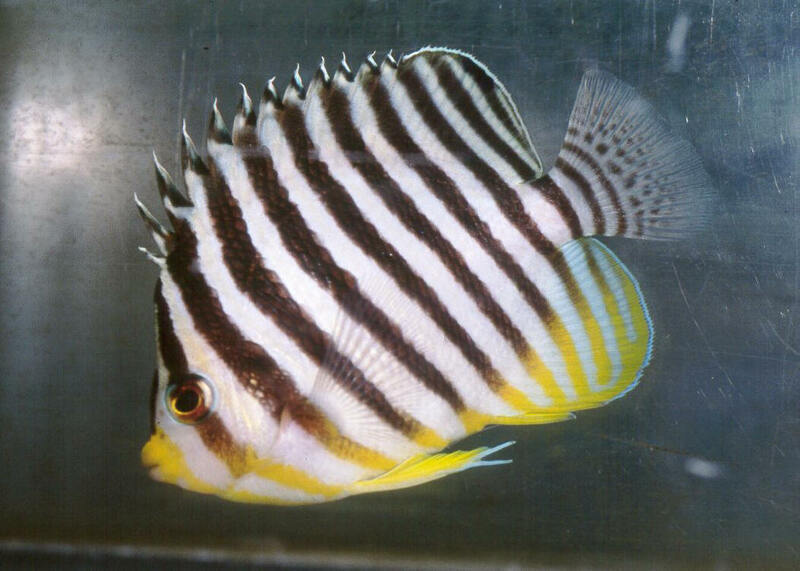 Paracentropyge multifasciatus (Smith & Radcliffe 1911), the Multi-Barred Angel (2). More deep-bodied than other Centropyge and with 13 versus the usual 14, 15 dorsal rays of other dwarfs. Not imported regularly in any numbers. Indo-Pacific; Cocos Keeling to the Society Islands, GBR and Micronesia. To 11 cm. Shy and retiring species. 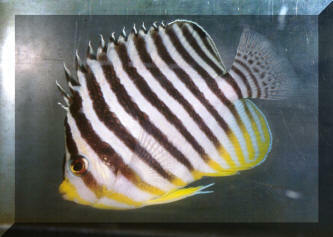 An aquarium specimen. Acanthurus coeruleus Bloch & Schneider 1801, the Atlantic Blue Tang; though not as dazzlingly beautiful as the other two "Blue Tangs" (Paracanthurus hepatus & Acanthurus leucosternon) this Caribbean surgeon makes a fine aquarium addition. One of a handful of Acanthurus that are overall yellow as juveniles, the Atlantic Blue Tang stays small enough for modest sized aquariums. A juv. in Grand Turks. Acanthurus coeruleus Bloch & Schneider 1801, the Atlantic Blue Tang; though not as dazzlingly beautiful as the other two "Blue Tangs" (Paracanthurus hepatus & Acanthurus leucosternon) this Caribbean surgeon makes a fine aquarium addition. One of a handful of Acanthurus that are overall yellow as juveniles, the Atlantic Blue Tang stays small enough for modest sized aquariums. A later juv. in Key Largo.